Sync your configuration between multiple computers. Lock Rambox if you will be away for a period of time. Reorder applications in the tab bar. Notification badge in the tab. Mute audio to specific service. Separate tabs floating to the right. Disable a service instead of remove it. Start automatically on system startup. Switch from horizontal to vertical tab bar. Sessions will persist using the partition:persist attribute for Webviews. So every time you open Rambox, your sessions will keep alive until you remove the service. Help us translate Rambox on https://crowdin.com/project/rambox/invite. Want to report a bug, request a feature, contribute to or translate Rambox? We need all the help we can get! Fork and work! # update env.js with your auth0 details. See Contributing.md for more detailed information about getting set up. 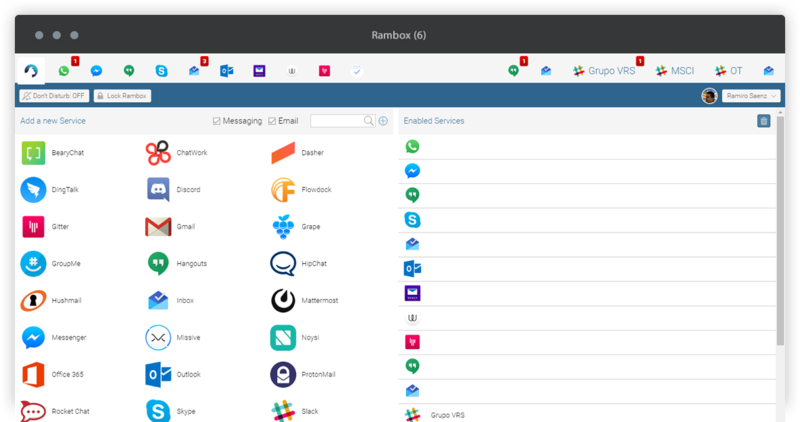 Rambox is not affiliated with any of the messaging apps offered.